The closure of an RAF base in Rutland has moved closer with the disbanding of one of its four Harrier squadrons and the transfer of another. RAF Cottesmore, one of the county's largest employers, is closing to fund new helicopters for Afghanistan. 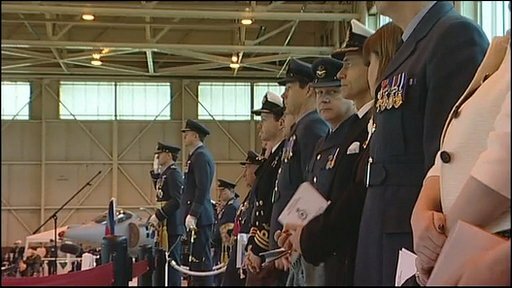 A ceremony was held to mark the end of 20 (reserve) Squadron, which was formed in 1915, and the move of 4 (AC) Squadron to RAF Wittering. 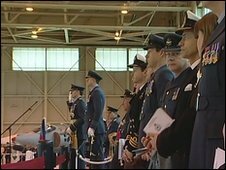 The Ministry of Defence has said 1,000 of the base's 3,500 posts will go. The remaining posts will move when the rest of the Harrier jets transfer to RAF Wittering next year - before being phased out of service altogether. Wing Cdr Lincoln Taylor of 20 (reserve) Squadron said the unit had done its duty. "I am incredibly proud and privileged to lead 20 Squadron as we lay up the standard. "We are going to Barnack Church this afternoon to lay up our standard formally in the church and that again is quite a moving ceremony that reflects the history of the squadron and those who served on the squadron before." Harriers from the base have been on operational duties for the past five years. RAF Cottesmore opened in 1938 and during the 1960s was the base for nuclear-capable Vulcan bombers. It has been home to the Harrier force since 1999. Nearby residents and business leaders have said the base's closure will have a devastating affect on the area.